While it is in a geographically concentrated area, there is an important tornado and very large hail threat in parts of Oklahoma and Texas. 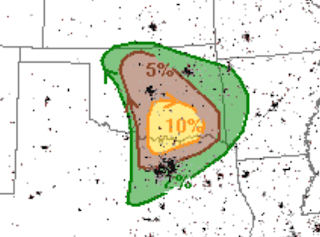 From the Kansas border to the Dallas-Ft. Worth Metroplex, there is a significant chance of tornadoes with an enhanced chance in southern Oklahoma from around Norman to just south of the Red River. I recommend people in this region pay attention to the weather later today. It is a "put your car in the garage day"! The significant threat level on this map is 15% (yellow) and, as you can see, the threat is 45% from near Perry to DFW. The hatching means the hail could be larger than 2 inches. I'll update on these threats later today.